I love repurposed materials and products. Pallets for chairs or tables, shipping crates for retail stores and this one – solar hot water panels from old fridge radiators. 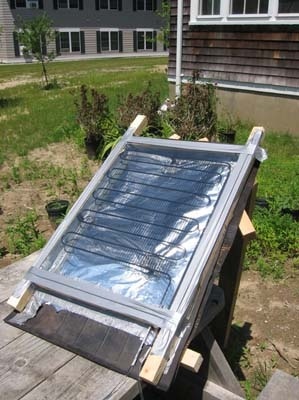 The Sietch website as a few repurposed products, including making a solar hot water panel from the heat rejection device on the back of a fridge. With some imagination, time and innovation unnecessary waste can be reduced through repurposing. What is there that could be repurposed on a large scale in buildings? ← Tri Harder – Part 4, Why do we consider carbon payback?